A seaweed and mineral enriched bath that hydrates and renews. Relaxes the body for a rejuvenating bath experience. Soak and feel good! 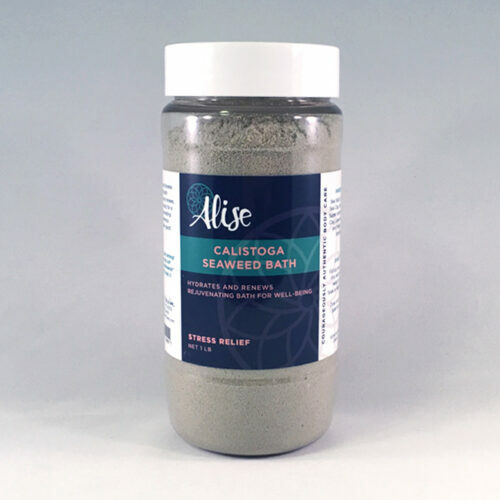 The Calistoga Seaweed Bath is a seaweed and mineral enriched bath that hydrates and renews the body. 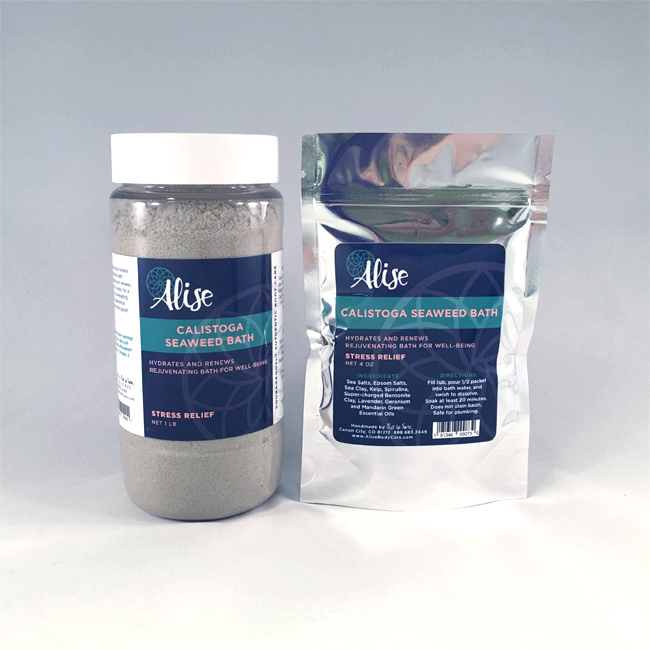 This nutrient-rich bath is a unique combination of seaweeds (kelp and spirulina), mineral-rich salts, super-charged bentonite clay, and pure essential oils. Seaweed offers immune-boosting and detoxifying benefits. The salts, when combined with temperate water, increase circulation and allow the body to become buoyant. This, in turn, helps move toxins to excretory organs where they can be released from the body. The minerals from both the seaweed and the salts are absorbed by your body and replenish it at a cellular level. And finally, our Stress Relief blend of essential oils provide powerful aromatherapy for a rejuvenating bath experience. Our Calistoga Seaweed Bath is available only in the Stress Relief scent. 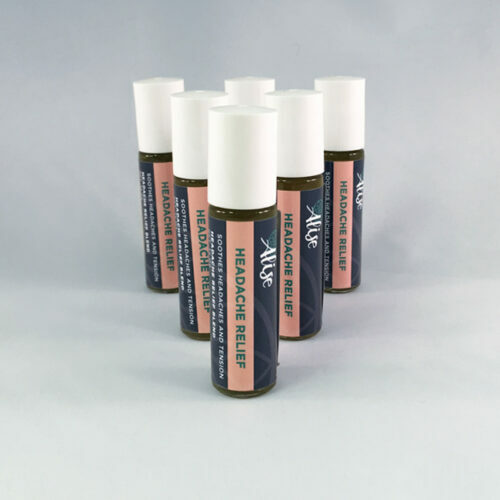 This is a feel-good blend of lavender, geranium, and mandarin green essential oils. 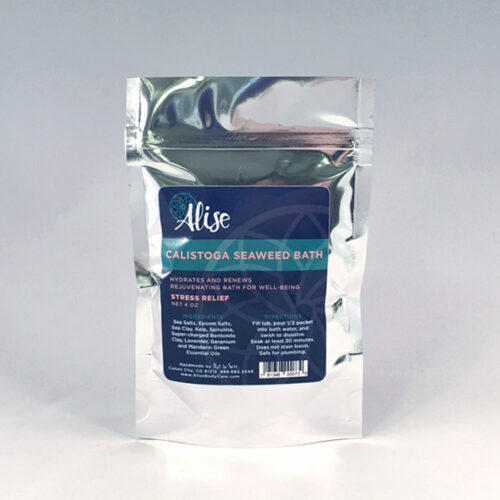 The Calistoga Seaweed Bath is available in 4 oz packets, 16 oz jars, and in bulk. We recommend using 1/2 to a whole 4 oz packet per bath. A 16 oz jar should provide six to eight baths, depending on the size of the tub. To maximize the benefits of the seaweed bath, add the bath salts just before entering the tub, gently swish the water to dissolve the salts, and soak for at least 20 minutes. The salts and clays will not stain the tub and are safe for plumbing. The Calistoga Seaweed Bath is inspired by our roots near the historic mud baths and spas of Calistoga, CA, and are unique in their blend of seaweeds and salts. Our customers who are looking to boost their immune system love our seaweed bath. In addition, they have shared how deeply hydrating and calming our seaweed bath can be. Know someone who absolutely loves lavender? Then treat them to our Lavender Lovers Gift Set! 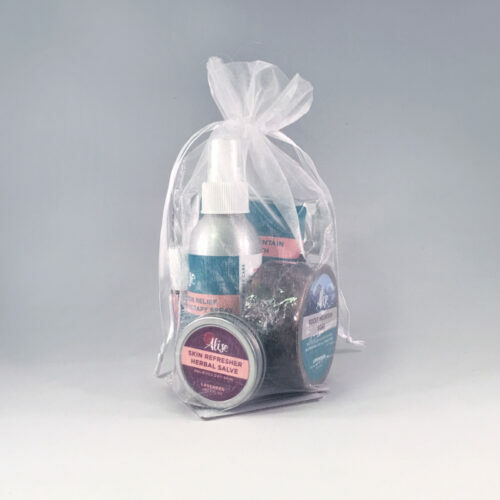 This gift set includes the best selling products in our luxurious lavender line. Enjoy savings when you purchase as a gift set versus individually. Mix n Match some of your favorite aromatherapy roll on products into an easy gift set of six items. Enjoy savings when you purchase via Mix n Match versus individually. Stress happens, and we want you to be ready for it! That’s why we created our Stress Relief Gift Set to help you or someone you love through the challenging stuff of life. Enjoy savings when purchased as a Gift Set versus individually.